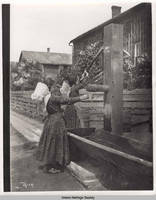 One girl is pulling on the lever to produce water, and the other girl is holding a cup up to the pump spout. They are dressed in long dresses with patterns. Sun bonnets are tied around their necks, and they are wearing caps.